Mike May spent his life crashing through. 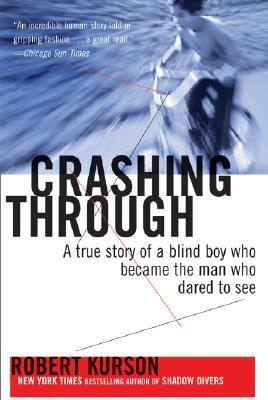 Blinded at age three, he defied expectations by breaking world records in downhill speed skiing, joining the CIA, and becoming a successful inventor, entrepreneur, and family man. He had never yearned for vision. Then, in 1999, a chance encounter brought startling news: a revolutionary stem cell transplant surgery could restore May’s vision. It would allow him to drive, to read, to see his children’s faces. But the procedure was filled with gambles, some of them deadly, others beyond May’s wildest dreams. Beautifully written and thrillingly told, Crashing Through is a journey of suspense, daring, romance, and insight into the mysteries of vision and the brain. Robert Kurson gives us a fascinating account of one man’s choice to explore what it means to see–and to truly live. Robert Kurson earned a bachelor’s degree in philosophy from the University of Wisconsin, then a law degree from Harvard Law School. His award-winning stories have appeared in Rolling Stone, The New York Times Magazine, and Esquire, where he is a contributing editor. Crashing Through is based on Kurson’s 2006 National Magazine Award-winning profile in Esquire. He is the author of Shadow Divers, and he lives in Chicago. Visit the author’s website at www.robertkurson.com.